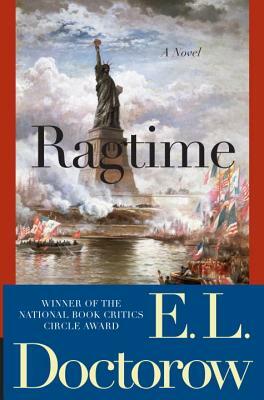 Set in New York City in the years immediately before the outbreak of World War I, Ragtime is a grand, sweeping novel that locks its teeth around a particular era and explores it with unflinching honesty. Through a cast of carefully chosen characters, Doctorow paints for us a picture of a time of contrast and hypocrisy. There is JP Morgan, the wealthiest man in America, struggling to understand Henry Ford's proposal of an assembly line, dumbing individual men down to the most menial task, to be repeated on a timeline determined by industrial machinery. But there is also Tateh, a struggling Jewish immigrant who refuses to be nothing more than a cog in the wheel of capitalism, traveling around the East Coast with his daughter in an attempt to find a place where he can be an individual. There is Harry Houdini, the masterful escape artist who finds the praise he garners empty and meaningless, for what has he done to change the world? And there is the young boy who relishes the discarded items of those around him, finding meaning not in what is deemed important, but in what is deemed unimportant. These strange characters are inextricably linked by unexpected and unforeseen events seemingly outside their control; the young boy’s uncle is in love with a woman who meets a revolutionary who is arrested for creating anarchy when a criminal holds up J.P. Morgan’s library when his fiancé is killed when she leaves the house of the mother of the young boy’s uncle. And so on. Despite the fact that so far I have painted a picture of a book torn by contrast and chaos, Doctorow’s novel is anything but scattered. Perhaps it is saved from this fate by the slow, steady, plodding of Doctorow’s writing; the story is told through the eyes of an unidentified narrator who speaks (or writes) in the meter of what one might imagine a rag would look like on paper. Or maybe it is Doctorow’s genius that he can link together as many characters as he chooses, keeping them intertwined in the fine fabric of turn-of-the-century New York. Or maybe it is because this chaos and confusion is intentional, reflecting perfectly the chaos and confusion of a time that has yet to identify itself, yet to come to terms with itself. In an era of awkward new technologies and revolutionary mindsets, Doctorow’s characters struggle to find themselves as individuals, defining their existence by an odd collection of extravagant and seemingly impossible feats - but these feats are not impossible, they are in the mark of a new century, of a new decade, a new era. Bottom line: I seem to have written more of a book report than a book review, but Ragtime seems to me to be the kind of book that goes beyond a book review. It is beautifully crafted, ingeniously pulled together and craftily presented. It is powerful, emotional, and honest in its slow progression. Doctorow's grasp of historical events is so complete that I found myself wanting to look up every detail to find out what was true and was was fictionalized - the mark of successful historical fiction, if you ask me. Highly recommended. ...Now I'll have to see the movie to see how it weighs in. "These strange characters are inextricably linked by unexpected and unforeseen events seemingly outside their control; the young boy’s uncle is in love with a woman who meets a revolutionary who is arrested for creating anarchy when a criminal holds up J.P. Morgan’s library when his fiancé is killed when she leaves the house of the mother of the young boy’s uncle." Appears to be, albeit a clunky one. I feel the review is good and captures the spirit of the novel. I like Ragtime mainly because of the 'ragtime' metre of narration pace. It is slow and steady. It is seemingly cold and unemotional. But at the sametime delivers the desired effect with an astounding punch, e.g, the narration of the final act of Houdini, where he fails to escape. Adding a little more : I read Ragtime, when I was graduating from teenage to my twenties, and I was overwhelmed by the breadth and depth of the historical scenario, the plethora of characters and the influence of the pervasive political and cultutal ethos on the human lives and above all the twin themes of human invincibility and vulnerability.